Children enjoy among koinobori streamers at Peace Memorial Park in Mabuni, Itoman. Koinobori, or carp streamers, are flying in many places on Okinawa during the Golden Week. Originally appeared as symbols for the Boys Day, they are now flown in honor of all children, who the parent hope will grow up to be as strong and determined as carp, a fish that is strong enough to swim up a waterfall. The Peace Memorial Park Koinobori festival runs from Apr. 28 through May 5 at the Memorial Park Ceremony Square in Mabuni, Itoman City. 20,000 paper Koinobori fly in the Peace Memorial Park. The event includes a Peace Memorial Museum Course for parents and children, a video to learn about war and the importance of peace, a Peace Memorial Temple Course, and a visit to the peace memorial statue to think about war and peace. 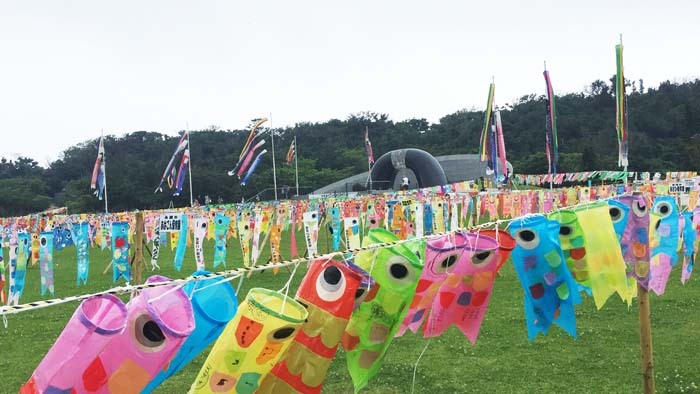 There is a giant 30-meter long koinobori flying along 20,000 small ones, and workshops where children and parents can make their own paper koinobori, kites and toys. A ¥300 fee cover the materials, but admission to the event is free. Oku Yambaru-no Sato Park at the northernmost part of Okinawa Island has koinobori flying from Apr. 29 through May 8 over the river that runs through the park. There are stage performances on May 3, 4 and 5 featuring children’s and youth groups’ Eisa performances, folk songs, hula dance and bingo games on each day between 13:00 and 18:00. Admission to the event is free. Motobu Port features koinobori that are not in the form of traditional carp but tuna to commemorate the tuna fishing tradition of Motobu. The festival features stage events such as street performances, children’s Eisa and free servings of bonito sashimi on May 4th and 5th. Fireworks end the festival on both days. 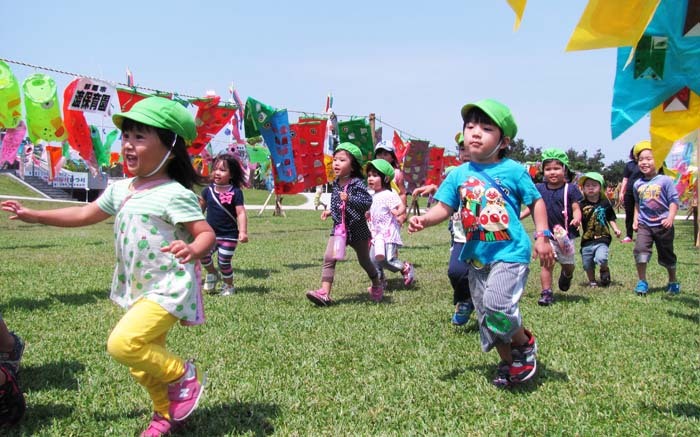 Okinawa Kodomo-no Kuni or Zoo features Children’s Festival with events spanning Apr. 29th through May 5th. 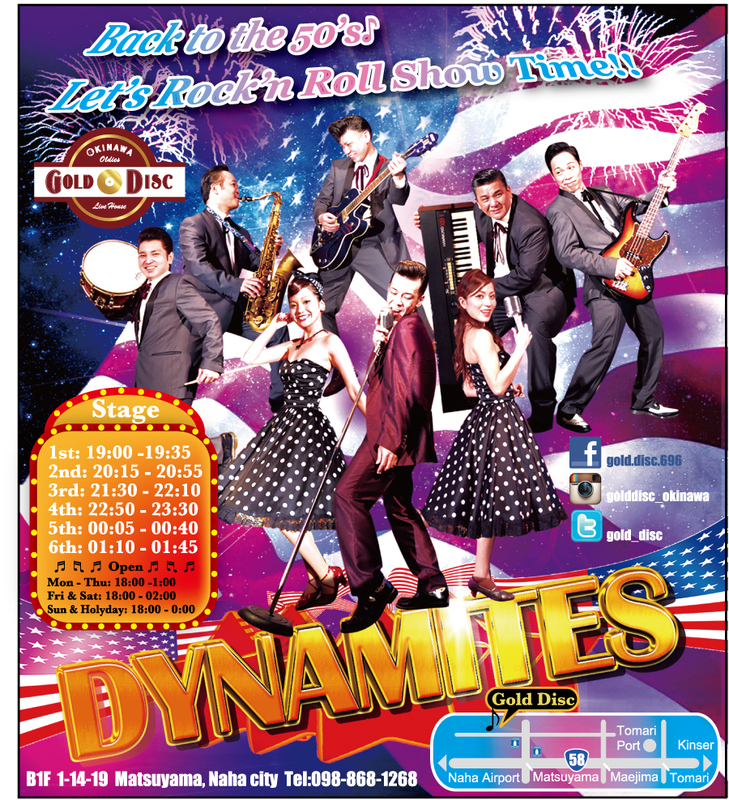 The main events take place from May 3rd to 5th with dance, live music and comedy on stage. Tickets to the event a ¥500 for adults and ¥200 for high and junior high school students. Elementary school age and younger children are free.